The Kennel Club has approved a new official DNA testing scheme for Hereditary Footpad Hyperkeratosis (HFH) in Irish Terriers, following consultation with breed clubs. 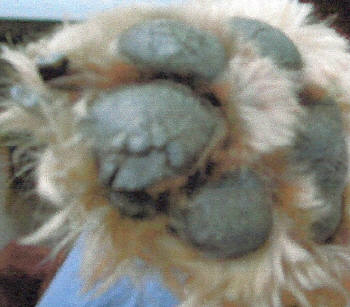 Hyperkeratosis (Cracked Pad) is a defect which is very rare in Irish Terriers, the incidence of which has reduced in recent years due to the dedication of responsible breeders. The laboratories that the Kennel Club is able to record results from can be found by referring to its worldwide DNA testing list at www.thekennelclub.org.uk/media/14688/dnatestsworldwide.pdf. From this list, copies of all future test certificate results issued by Laboklin and Animal DNA Diagnostics will be sent directly to the Kennel Club. Results from the other laboratories mentioned can be recorded upon owner submission. Caroline Kisko, Kennel Club Secretary, said: "The Kennel Club is constantly reviewing DNA testing schemes in conjunction with breed clubs to ensure that breeders are able to continue breeding healthy dogs. "This particular condition is very rare in Irish Terriers these days because of the hard work of responsible breeders, and we are pleased to announce this new DNA test which will further help breeders make informed decisions when it comes to breeding, enable potential puppy buyers to be aware of issues which could affect their chosen breed, and ultimately protect and maintain the health of the breed. "The Kennel Club continues to work alongside breed clubs and breed health coordinators, in a collaborative effort to improve the health of pedigree dogs and we are happy to accommodate a club's request to add a new DNA test to its lists and would normally need a formal request from the breed's health coordinator or a majority request from the breed clubs." Test results will be added to the dog's registration details which will trigger the publication of the result in the next available Breed Records Supplement. The result will appear on any new registration certificate issued for the dog and on the registration certificates of any future progeny of the dog, and also on the Health Test Results Finder on the Kennel Club website. Results for dogs already tested can also be recorded, but owners will need to submit copies of the DNA certificates themselves. If the owner includes the original registration certificate for the dog (not a copy) then a new registration certificate will be issued, with the DNA result on it, free of charge. Please send any DNA test certificates to Health & Breeder Services, The Kennel Club, 1 - 5 Clarges Street, Piccadilly, London, W1J 8AB or scan and email copies of the certificates to hbs@thekennelclub.org.uk. Hereditary Footpad Hyperkeratosis leads to thickening and hardening of the footpads. About 11% of Irish Terrier are carriers of the gene responsible for the disease. A reliable DNA test can screen breeding dogs, in order to adapt matings and avoid birth of affected puppies and the spread of the disease in the breed. The Hereditary Footpad Hyperkeratosis, also called corny feet leads to a thickening and hardening of the footpads resulting from abnormal proliferation of cells of the skin. A horn Growth is observed under the four footpads. Affected puppies suffer from painful cracks and crevices in the most severe cases, resulting in a difficulty to move. In some cases, nail growth problem, or alteration of hair morphology are observed. The first symptoms appear around the age of 4 to 9 months. Around 11% of Irish Terrier in Europe are carrier of the genetic mutation for hyperkeratosis. A dog « carrier » of the mutation will not develop the disease but transmits it to 50% of the puppies. A breeder can unknowingly mate a male « carrier » and a female « carrier » and produce a litter containing affected puppies. A breeding dog « carrier » of the mutation which is used a lot for reproduction, spreads the disease through the breed and helps to increase the frequency of the mutation and multiply the number of affected dogs. Research conducted by the team of Prof. Tosso Leeb (University of Bern) in collaboration with ANTAGENE have lead to the development of a DNA test, called test HFH-A. This DNA test can detect the hyperkeratosis of the footpads in the Irish Terrier and Kromfohrlander breeds with reliability greater than 99%. In order to secure its kennel and avoid the risk of production of affected puppies, the breeder must screen its breeding dogs thanks to the HFH-A DNA test. When acquiring a puppy for breeding or when a breeding dog is used for a mating, the breeder verifies the genetic status of the dog for the result of the HFH-A DNA test. The veterinarian performs a simple cheek swab and sends it to the laboratory. The result, delivered within few days, indicates if the tested dog is clear, carrier or affected for Hereditary Footpad Hyperkeratosis. A genetic certificate displaying the result must be used as a guarantee for a mating or to justify the sale of puppies clear from Hereditary Footpad hyperkeratosis.